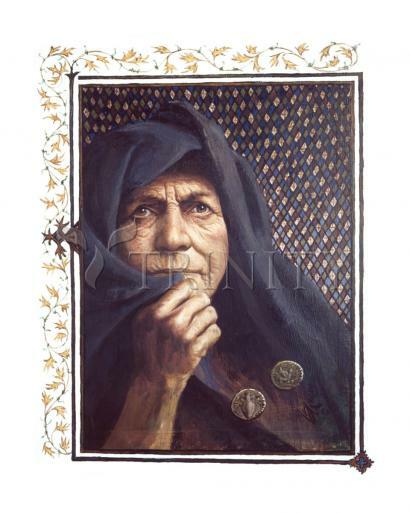 "He saw the rich putting their offerings into the treasury, and also a poor widow putting in two copper coins. At that he said: 'I assure you, this poor widow has put more than all the rest. They make contributions out of their surplus, but she from her want has given what she could not afford -- every penny she has to live on.'" Mark 12:41-44 41 And he sat down over against the treasury, and beheld how the multitude cast money into the treasury: and many that were rich cast in much. 44 for they all did cast in of their superfluity; but she of her want did cast in all that she had, even all her living. Luke 21:1-4 1 And he looked up, and saw the rich men that were casting their gifts into the treasury. The Jews were instructed to give to the Temple and to the poor as part of their service to God. (So are we). One day Jesus sat at the Temple and watched people putting money into the offering boxes. Some people were rich and gave lots of money. Some gave money, but were unhappy about it. Then a poor woman, a widow, came up to the boxes. The poor woman put two of the smallest coins there were in the offering box. The disciples with Jesus weren't very impressed, but Jesus said this woman has given more than any other today. How could that be? Jesus said it was because it was all she had. How did the woman think she would buy dinner that night? She trusted in God to provide for her. She obeyed God's command, knowing that He would fulfill His promise to care for her in return. We must trust God the same way. Matt 6:33 says: "Seek first the kingdom of God and His righteousness and all these things (food, clothes, etc) will be added unto you."